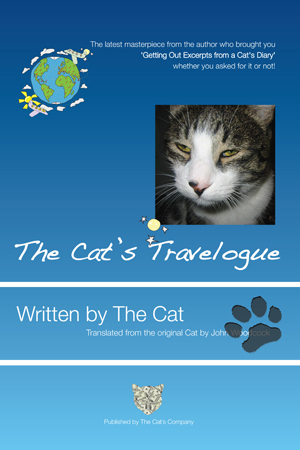 To accommodate my latest masterpiece ‘The Cat’s Travelogue’ my web design Kittens have been working around the clock to redesign, improve and extend my www – wickedly wonderful website www.thecatsdiary.com. So now when you arrive at my www – wickedly wonderful website www.thecatsdiary.com you have the choice of viewing my www – wickedly wonderful website www.thecatsdiary.com in either the original Getting Out Excerpts from a Cat’s Diary mode or click the page turn icon at the top on the right hand side and enter… wait for it… The Cat’s Travelogue mode of my www – wickedly wonderful website www.thecatsdiary.com isn’t that neat? Aren’t my web design Kittens just the coolest web designers around? The answer there is yes by the way. My clever web design Kittens have included the usual high quality features you expect from a truly www – wickedly wonderful website although of course we all know that there is only one www – wickedly wonderful website and that one is mine www.thecatsdiary.com and that is because it was me that invented the concept of www – wickedly wonderful website what a clever Cat I am! But then you know that don’t you my dear cuddle readers and my new friends. So do go and visit my www – wickedly wonderful website and take a peek at the changes and if you like them do let me know through the usual channels or blind drop boxes.